This reply was created from a merged topic originally titled Lightroom: Sort option badly needed. Additionally, it would be very useful to be able to combine such sorts with one or more (hierarchical) keywords. In my case those that identify the object by type, because the same location can have different types of objects. Since all of this info is already part of the database I find it incomprehensible that it cannot be put to good use. PLEASE implement decent sorting routines soon! This reply was created from a merged topic originally titled Sort Order: Megapixels. I agree that it would be good if LR let you sort on additional criteria. If your ultimate goal is to identify pics that are too small or too large, you can use smart collections with the Megapixels criterion, e.g. A couple of other plugins provide a little more flexibility in filtering by megapixels, but if you want to produce a collection that is correctly sorted by megapixels (cropped or uncropped), see the Data Explorer plugin. This reply was created from a merged topic originally titled LR: Allow multiple levels of sorting. LR current allows sorting of images by a single criterion, such as ordering by 'capture time' or 'filename' or 'rating'. What happens if multiple photos have the same sort value, eg., rating? How are photos of the same sort value then 'sub-sorted'? Typically this is handled by allowing multiple levels of sorting (eg., as Microsoft Excel does). This would be even more valuable if LR supported sorting by any metadata field, eg., by title or GPS latitude or keyword-value (keyword-value pairs were supported, which I'll post separately as an idea). I'd like to sort in Library by a metadata field that isn't offered in the Sort menu. Rather than asking for my favourite-of-the-day field to be added to the Sort, why not add the ability to sort by any metadata field, similar to the way LR allows filtering by any metadata field? And/or, what about allowing sorting by a user-defined (via script?) function? And/or by a user-provided query string. This reply was created from a merged topic originally titled Lightroom: Ability to sort by Caption or Title. 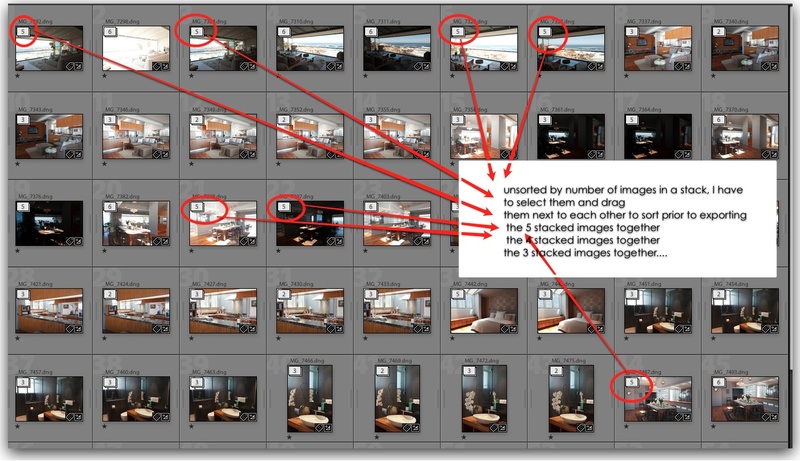 This reply was created from a merged topic originally titled Lightroom: Sorting by number of images in a stack. This reply was created from a merged topic originally titled Lightroom - sort photos by dimensions. Can we get the ability to sort photos by dimentions in Lightroom CC. I'm using photos for a video presentation and need photos large enough to allow zooming in to show features. This is avaiable in Photoshop Bridge, but Lightroom is far more efficient at this. In the past, I believe that you've wanted to induce folks to buy photoshop, but now anyone with Lightroom CC also has photoshop anyway so no reason to cripple lightroom CC. 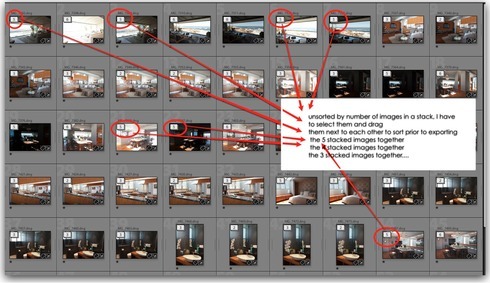 This reply was created from a merged topic originally titled How to sort by Title in Lightroom 4?. I want to sort my images by TITLE. Can this be done in Lightroom 4.4? This reply was created from a merged topic originally titled LIGHTROOM - Please add the ability to sort by Copy Name. Feature Request: Please add the ability to sort by Copy Name. Thanks. This reply was created from a merged topic originally titled Lightroom: Sort out pictures by the gps tag or by location in Library mode. LR4 :I 'd like to sort out pictures by the gps tag or by location, directly in the library module. Luc, nothing will be done with Lightroom 4 which has long finished. Luc posted his reply 4 years ago, but it was just merged with this topic. Unfortunately, the Get Satisfaction software doesn't show the original date. This reply was created from a merged topic originally titled sort grid by titles or captions. sorting grid images by their titles or captions would go a long way to allowing flexible arrangement of images for varied destinations. Check out the List View and Data Explorer plugins -- they're a little less convenient but can get the job done. Just adding to the chorus here: sorting by File Size. I switched over from Aperture, and was really disappointed to discover I can no longer do this basic search. If the data is available, it should be usable as a search/sort/smart criteria. Lightroom is ultimately a database of photos with the ability to edit...so making that fully functional in the database side is crucial. No big deal to implement. It seems to have been wanted for a long time. When will we be able to do a simple sort by title??? Hi Sarah, can you perhaps explain to the engineers how that would benefit your workflow? As you can imagine, there's a lot of prioritization that goes on, and really compelling workflow reasons do help give a request extra weight. You might also like to try to plug-ins mentioned above, as they can already sort by title for you. A quick Google shows that this has been a request on many forums since at least 2010. I'm not asking for new code - the sort algorithms are already there, just add an extra option to the menu. In my case, I have a collection of images and I need to print a contact sheet in alphabetical order by title. Obviously, I have the title in the title field, so need to be able to sort on that. At present, I have to do this manually. I shouldn't have to pay a third-party for a plugin to add what should be standard functionality. This reply was created from a merged topic originally titled Can someone over at LR make a very simple addition: under Sort, add Keywords.. This ould make my wedding workflow SO much faster: I add keywords like "1-Prep, 2-Ceremony" etc... then view them in the order I want the categories to be in, then rename. With multiple cameras and shooters, we shoot details throughout the day, but I don't want my clients and guests to be viewing portraits of the couple, then random table details. I need them all in categories to present. YES, I can make label texts, but it would be so much faster with a keyword I can add, then rename and number, then remove if need be. This reply was created from a merged topic originally titled Order by Title and/or by Copy Name. I'm really frustrated by the low range of options available for reorder photos in catalog and collections. Please add the possibility to reorder by Title and/or by Copy Name in order to create automatic custom orders without renaming the file or dragging up and down photos. This reply was created from a merged topic originally titled Lightroom: Ability to sort images by aspect ratio/pixel dimensions. How do I sort a mountain of images into say 1:1, 3:2, 4:5 and custom aspect ratios in Lightroom ? (Can only find a filter by orientation and cropped dimensions). Is there a plugin that would even tack this information onto the filename ? ~ John This reply was created from a merged topic originally titled Lightroom: Ability to sort images by aspect ratio/pixel dimensions. This reply was created from a merged topic originally titled Lightroom: More sort fields. This reply was created from a merged topic originally titled Lightroom: Why can't I sort by image size and dimensions. This reply was created from a merged topic originally titled Lightroom: Why can't I sort by image size and dimension like Bridge does...or hav....The long and short of it is in the question, however, the suggestion at the bottom here is to get emotional and asks how it makes me feel. Well then. I've invested an awful lot of time consolidating the best part of 2TB worth of images originally scattered all over the place from different drives. Lightroom is good for that. However, so many are duplicated and are in different sizes. Easy then. Just sort by size, then get rid of the small duplicates...Just like I can do in Bridge. Only I must be missing something. I see no option to do so. At this stage my blood is starting to boil. Are those good people at Adobe so short sighted as to have left this option out? WHY?!!!! This reply was created from a merged topic originally titled Lightroom: Bizarrely lacks sort by file size function. This reply was created from a merged topic originally titled Lightroom bizarrely lacks sort by file size function..Lightroom bizarrely lacks sort by file size function. Please add to next update! Anyone who doesn't see the URGENT need for this function it would seem doesn't have much of a photo library, with edited/copied/duplicates to sort. Think numerous Macs/portable hard drives and the inevitable build up of backups. I'd rather have too many copies than delete an important image hence the issue. I can sort by 'file type' or 'file extension' which to me seems redundant compared to what I am asking as the two are rarely different. I have to resort to using the finder - which not only I shouldn't have to - but that it also interferes with Lightrooms' catalogue/folder hierarchy/structure/integrity and surely the task should be a very basic feature of Lightroom. I'm not only still frustrated after each update reveals this function is still missing but stunned that it's not been there since the very beginning. Outside plugins and apps are available but why on earth is it not a basic function. Did I repeat basic function? Basic function. This reply was created from a merged topic originally titled Lightroom: Sort by file size. I see we can sort by Aspect Ratio; however, that is NOT the same as File Size. Particularly when dealing with smartphones and backups, duplicates can have different timestamps, filenames, etc., but still be the same (or nearly so) image with the same file size. Sorting by File Size would allow us to quickly skim the thumbnails to find duplicates! In Lightroom (Classic 2019) would like to sort a collection of images by caption. Is this implemented yet? I just made a slideshow and I want it to play in an order by caption, alphabetically. As stated here previously the sorting options in Lightroom seem to be lamentable. As far as I can tell, still no sort by "Caption". The List View, Data Explorer, and Any Filter plugins can sort by additional fields (and multiple fields).